Alps OutdoorZ's Crossfire X is the perfect solution for the hunter that is looking for a single pack for multiple uses. It is just as at home in turkey woods as it is in the deer stand. The 2325 cubic inch workhorse has a vented back panel, Lycra shoulder straps and punched molded foam waist belt for maximum airflow and comfort. 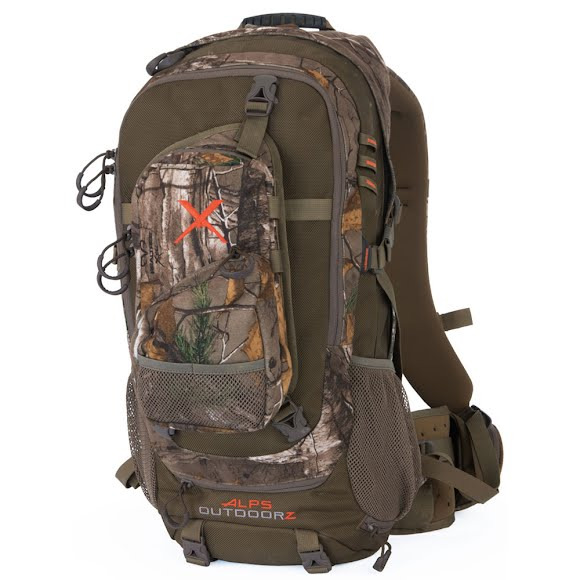 Alps OutdoorZ &apos;s Crossfire X is the perfect solution for the hunter that is looking for a single pack for multiple uses. It is just as at home in turkey woods as it is in the deer stand. The 2325 cubic inch workhorse has a vented back panel, Lycra shoulder straps and punched molded foam waist belt for maximum airflow and comfort. Not only is the Crossfire comfortable but it can also handle the abuse of the most demanding hunters. 1680D ballistic nylon and Hypalon at stress points ensure the comfortable carry is accompanied with strong components to get the job done. The defining feature of the Crossfire X is the removable accessory pocket, which can be used in 3 different positions. It can be buckled to the rear of the pack, attached on the front shoulder straps, or used without the pack by its own strap. So if there is a need to ditch the pack the accessory pocket can be worn independently allowing you to keep your essential gear you need with you without having the entire pack. This is also a big advantage while sitting in either a deer stand or the turkey chair. Other notable features are the gun/bow carrying system, hydration pocket and port, included rain cover, along with lower mesh pockets and bottom and side compression straps.